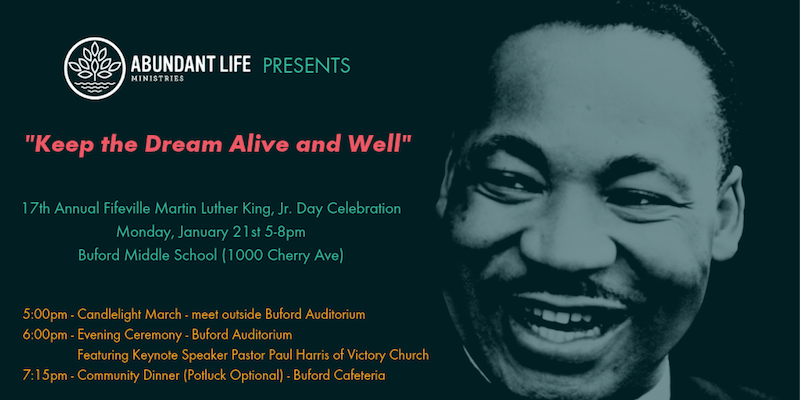 Abundant Life invites you to a special evening of events in honor of the Reverend Dr. Martin Luther King, Jr. on Monday, January 21, 2019. The 17th Annual Fifeville Martin Luther King, Jr. Day Celebration’s theme is Keep the Dream Alive and Well and features free family-friendly activities. We will kick off the events with a candlelight march for unity through the Prospect neighborhood, starting outside of the Buford Middle School auditorium at 5:00pm. Participants will be encouraged to sing spirituals and hymns while marching through the neighborhood before returning to the Buford auditorium for the 6:00pm evening ceremony. The ceremony will feature music by The Beloved Community Band, community awards presentation, and an inspirational keynote address by Pastor Paul Harris of Victory Church. The celebration will culminate with a potluck-optional fellowship dinner in the Buford Middle School cafeteria at 7:15pm.